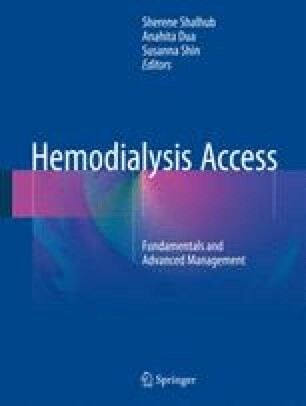 Creation of adequate dialysis access is the most critical component of renal replacement therapy. Proper site selection can provide years of maintenance-free dialysis, whereas selection of a suboptimal site leads to multiple procedures, high cost, inadequate dialysis, and even a shortened life span. Thoughtful, thorough preoperative planning is the first step in this process. The choice of procedure depends on the individual’s goals of care and will be very different for a young person at the beginning of his or her illness than for an elderly patient who has suffered for decades with multiple prior hospitalizations. For some, peritoneal dialysis is the best option. It is well tolerated, more gentle than hemodialysis, and can be done at home and in the evening. However, it requires a willing and compliant patient with a stable, clean home environment and suitable abdominal anatomy. For patients with a short life expectancy, a tunneled catheter may provide the most ready access with sufficient long-term patency. For most, the best access is a native arteriovenous fistula in the nondominant upper extremity. The choice of access is discussed elsewhere. This chapter will discuss patient evaluation with an emphasis on preoperative ultrasound imaging.